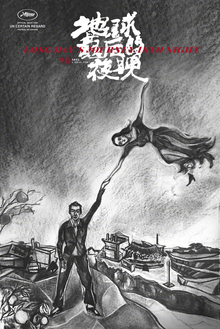 Long Day's Journey into Night (simplified Chinese: 地球最后的夜晚; traditional Chinese: 地球最後的夜晚) is a 2018 Chinese drama film directed by Bi Gan. It was screened in the Un Certain Regard section at the 2018 Cannes Film Festival. The film chronicles the return of Luo Hongwu (Huang Jue) to Kaili, the hometown from which he fled many years before. Back for his father's funeral, Luo recalls the death of an old friend, Wild Cat, and searches for lost love Wan Qiwen (Tang Wei), who continues to haunt him. ^ "The 2018 Official Selection". Cannes. Retrieved 12 April 2018. ^ 李子凡、張哲鳴、陳穎、陳薇安 (12 April 2018). "【坎城影展】賈樟柯5度競逐　張艾嘉《最後夜晚》入「注目」". 蘋果日報. Retrieved 12 April 2018. ^ ""Shadow" leads the Golden Horse nominations". The Film Experience. Retrieved 20 October 2018.